However it is important that you feel comfortable and able to work with your builder. Do your research. A building firm could be in your home for several weeks, so it is important that you trust them. Get references, which a good professional will be happy to provide, and check them out. If the builder claims to be a member of the Safe Local Trades, check that they really are members. You need several detailed written quotes and not just "It'll cost around £10,000". A good builder would prefer this anyway; it gives them time to really think about the job and what it will entail. Be aware of the legal requirements you must fulfill when having major improvements done. This is not up to the builder, unless you specifically ask him to do it. The work may require Building Regulations approval as well as planning permission, which can be a lengthy and complicated process - your local council will advise you. As 'project manager' you need to ensure that you know what you want and how you are going to get there. For example, what type of shower or boiler do you want? The cost of the product and installation may vary a great deal depending on the system chosen. A contract is a 100% necessity on every job to prevent misunderstanding. Draw up a written contract, which you can download from the Safe Local Trades website, with an agreed timetable that both you and the builder are happy with. Extending your home may cost tens of thousands of pounds, so it's worth protecting your investment. Should you move during that time, the insurance stays with the property and is passed on to the new owners. 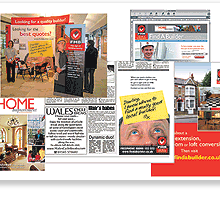 Help your builder to understand the look you are going for by showing them magazine pictures of similar projects. Make sure you fully understand every step of the building process and don't let jargon put you off. A professional builder should explain things clearly to ensure that there are no nasty surprises! If you're unhappy about the work, talk to your builder immediately. Most things can be amended before they are finished. Keep tabs on how the job is going; if it's complicated arrange a regular half-hour with your builder on agreed days. If you have personal requirements, such as no radios or smoking, or you'd rather not share your toilet or kitchen facilities, make sure that these are known before the job begins, but bear in mind that having happy workers may help achieve a successful outcome, so try to compromise. Always discuss how the builder's rubble will be disposed of, and when. Finally, you don't necessarily want to be walking to and from the kettle all day. One solution is to set up a small area near the worksite with tea and coffee-making facilities that builders can use without going into your kitchen.